I was first introduced to speculoos — also known as Biscoff or cookie butter — during a college summer internship. My predecessor had left an unopened jar of the stuff in my desk (I worked at a food magazine, so that’s not as weird as it sounds) which I unearthed one day while looking for Post-Its. With its bright red lid, brownish insides, and confusing picture of toast on the label, I was quick to judge. What the heck is this? I said, and held the jar aloft for the photo intern one cubicle over to see. She gasped. Eat that, she urged. With a spoon. Right now. It looked like peanut butter, and I was a college student, which meant that peanut butter-with-a-spoon was a weight-bearing pillar in my food pyramid. I had no real qualms. I peeled back the plastic and took a giant scoop. If you’ve had speculoos—a spread made from the spiced shortbread biscuits of the same name—you know the rest of the story. My eyes bulged out of my head. It was the most delicious thing I’d ever eaten from a jar, Nutella included, and the cardamom-nutmeg-gingery warmth was delightfully surprising. I spent the rest of the summer rationing scoops from my drawer each day to spread on the apples I brought in from home. When my spoon finally hit plastic at the container’s bottom in September, I felt like throwing a tiny wake. Before you get to the bottom of your jar—which I know you will surely run out to buy—try mixing the spread into batter and calling it breakfast cake. More: If you're an ambitious person, you can even make your own speculoos spread. 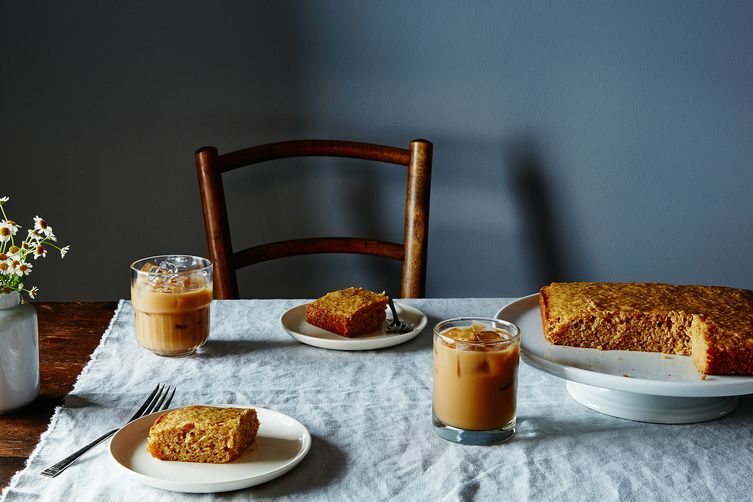 It’s moist, subtle, and ideal alongside a milky cup of coffee. It’s the kind of cake you can throw together on a Sunday night and leave under glass on the counter all week; the texture holds, the speckled powdered sugar top stays dreamy-looking, and you will still be cutting small squares for yourself every time you pass through the room deep into Thursday, if the cake lasts that long. Sorry to report that this recipe failed me. As I was mixing it, I was surprised to see that it called for 1 tsp. each of baking powder AND baking soda. Usually the amount of baking soda, if called for at all, is 1/4-1/2 that of the baking powder. Unfortunately I forged on, and when I tested the cake @25 min. , it compete sunk in the middle. A quick Google led me to learn that 1 tsp. baking powder is plenty leavening for 1 c. flour, and 1/4 tsp. baking soda is the equivalent http://m.joyofbaking.com/ingredients/bakingsoda.html So basically this cake has 4 times as much leavener as needed, causing it to puff up and then deflate like Baloo when pierced. Bummer. I don't know why you would imagine wasting this by putting it on anything besides a spoon and directly into your mouth. Trader Joe's also has speculoos cookie butter.And also a chocolate bar with cookie butter in the middle! Speculoos is the name of the traditional Belgian spice cookie that inspired cookie butter. Growing up in Belgium I just dipped my speculoos in my mom's coffee and spread that on bread. That was the original cookie butter. Aldi had Biscoff cookies for $2.99 cheaper than Walmart. Because I had already addicted my husband,I bought TWO full cases. I'm hoarding/hiding the last 10 or so packages. He takes a breakfast sandwich everyday,huge rustic whole grain Italian crusty bread (from Aldis) spread with soft cream cheese and Biscoff spread. Did you know it also comes in crunchy? Oh yes! For the record,Aldi does carry speculoos from time to time. Imported of course. They are lovely indeed . Wait . . . I googled "speculoos" and windmill cookies came up in the images. Are they one and the same? Or at least similar? My brother use to make mush with these and milk when we were kids! It was gross but delicious. I would go back to Belgium in a heartbeat just for one of the speculoos cookies that are always served with coffee. This speculoos paste is made by Lotus bakeries, the most widely known and sold brand of these cookies. They're good, but there's another brand, Vermeiren, in yellow packaging, which is far superior. However, the speculoos paste Vermeiren produces is far less appealing than the Lotus brand. In the late 1960s, early 1970s, I lived in Belgium, and a common breakfast or lunch sandwich was speculaas (the cookies) between two pieces of bread and butter. Your cake sounds like a much improved version! Is this real?!?! Cookies between two pieces of bread? With butter? Kristen Miglore, this might be Genius.